I want to Upload the file which can be in format of Png/Jpg/Apk/PPT/Pdf/Word to me web Service Project . Currently i am automating through Selenium webdriver and Maven project with TestNG Framework. 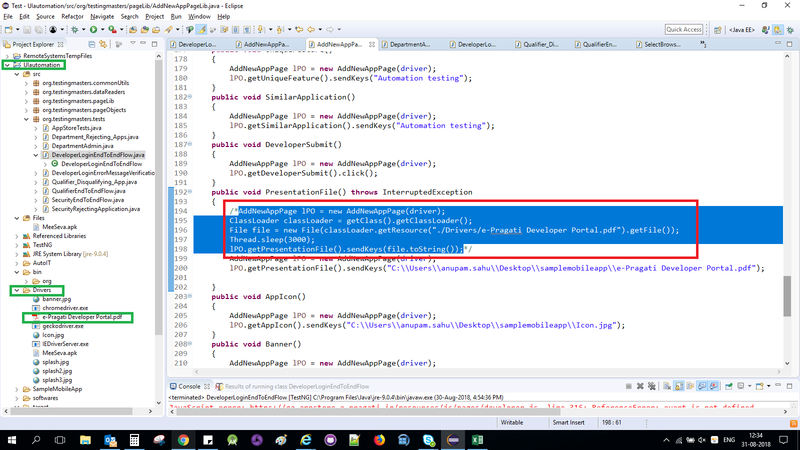 Issue Facing-I want a code for uploading all files directly from my folder which is inside the project but outside SRS in eclipse.But wile doing so i am getting an error of Null pointer exception or some time file not found error. Kindly let me know how to do it.Check the image in link provided.